this purpose, the same `sub' instruction example is followed. 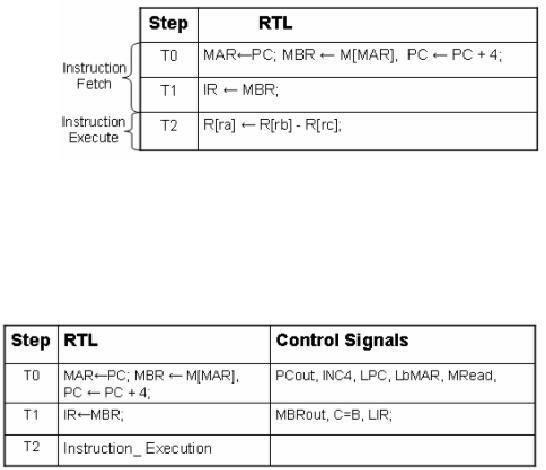 time step T0, the Memory Address Register receives the value of the Program Counter. the instruction execution can commence. register rc from rb, and assigning the result to the register ra. signals for the execute phase can be written in a similar fashion. 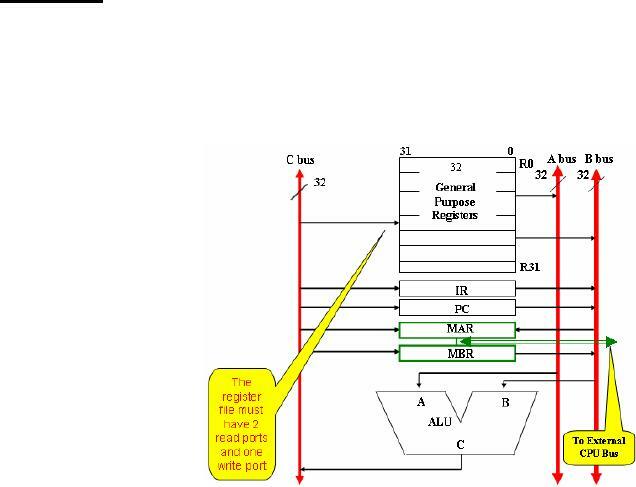 Reset operation is required to change the processor's state to a known, defined value. processors state may then be examined in its halted state. the PC and the general registers. results in initialization of PC only. 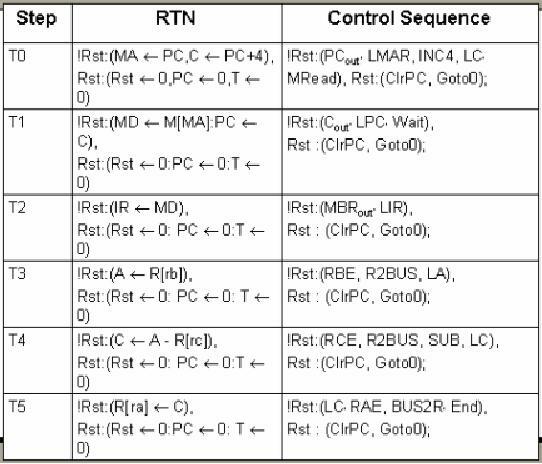 The reset signal in SRC is assumed to be external and asynchronous. There are basically two approaches to initialize a PC. The PC is loaded with the address of the startup routine upon resetting. jump instruction in turn contains the address of the required routine. be tested after each clock cycle. In step T2, the stored memory data is transferred to the instruction register. In step T3, the register operand values are read. In step T4, the mathematical operation is executed. In step T5, the calculated value is written back to register file. value of the step counter is also set to zero. processor is called an exception. click or an attempt to divide by zero etc. interrupting device that it can to load the appropriate exception handler routine. that a lot of space may be taken up by vectors and exception handler codes. In the information register, only one general purpose exception handler is used. allow identification of the cause and type of exception. value of the PC, general purpose registers, condition vector and external flags. interrupting process, so that another exception might not disrupt the transition. be the privileged instruction exception. which raises an exception when it has counted down to zero. after each instruction execution allows examination of the program variables. save the system state to the hard drive, or alert an alternate power supply. to respond to external events such as keyboard or mouse events.